Victor Yerrid is an actor and puppeteer; and is currently one of the Jim Henson Company's principal performers. 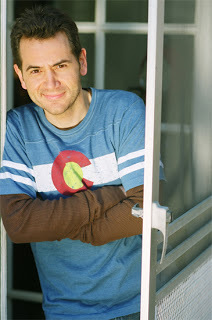 He has worked with Henson on many projects - including "Sesame Street", "Bear in the Big Blue House", "Farscape: The Peacekeeper Wars", "The Skrumps" and "Puppet Up! - Uncensored". Victor is also known in the Muppet world for his work on the online web-series "Statler and Waldorf from the Balcony" where he performed Waldorf along with a large assortment of other supporting characters. Victor has also puppeteered on other non-Henson projects including "Greg The Bunny", "Crank Yankers", "Team America", "Book Of Pooh" and "Between The Lions". Additionally he has lent his voice to such projects as "Robot Chicken", "Drawn Together", and "Celebrity Deathmatch". For more information on Victor, check out his website at VictorYerrid.com. We asked Victor if he would answer a few questions for the fans and share some insight on his work -- he was more than willing, and graciously took some time out to answer our questions. When did you first get interested in puppeteering? I was actually a classical music major in college. At some point during my last couple of years in school I got really into "Sesame Street" and, in particular, children’s songs. I started buying tons of recordings (Disney movies, "Sesame Street", "The Muppet Show") and started writing songs myself. Then I moved up to New York City and got an internship with "Sesame Street" in the hopes of writing songs for them. On my first day there I got a tour of the set - wow! It was the first time I had ever seen how TV puppeteering worked. I was hooked. So were you always a fan of the Muppets? I definitely remember watching "The Muppet Movie" when I was a kid and absolutely loving it. It’s still just about my favorite Muppet production. I really got into the Muppets though when I was just out of college. I started watching all of the movies and behind-the-scenes stuff from "The Jim Henson Hour". In truth I love just about everything they’ve done, but I guess "The Muppet Movie" and "The StoryTeller" series are probably my favorites. It’s hard to say though. There are so many great things in all of their productions – "Dinosaurs", "Fraggle Rock", "The Great Muppet Caper" – how can you choose??!! Did you do a lot of performing as a kid? Yup, mostly as a musician. My mom is a piano teacher so I started playing piano and doing recitals when I was around 3 or 4 years old. I eventually switched to percussion and studied that all through college. I also took some acting classes and did a few plays as a kid, but that mostly came when I got older. Was your family always supportive of your interest in puppets? Absolutely, and I consider myself extremely lucky because of it. So many parents try steering their kids into a specific career path. I’m sure the intentions are usually good, but it just seems to add unnecessary pressure. From the time I was a little kid, my parents made it very clear to me that they would be happy with whatever I wanted to do when I grew up as long as I was happy. When I was playing percussion they bought me a very expensive drum set, one piece per year. They didn’t have lots of money so it was a pretty big deal. When my Dad finally gave me the last piece he told me that he wanted me to take really good care of the instruments, but if I ever decided to quite playing music and do something else, that was fine with him too. How’s that for supportive! You worked for a time at the Muppet Workshop as the assistant to the Workshop Director. How did you come to work for the workshop and what were your duties? Ed Christie – wonderful, wonderful man. He was the head of the Muppet Workshop back then and I first met him through my internship at "Sesame Street". When that ended, I kept in touch with Ed and periodically checked in with him to see if there were any jobs available. Eventually he called me in for an interview. I’m not a puppet builder so my job there basically entailed administrative stuff – faxing, filing, computer work, etc. Good times. I also got to create a database for all of the Jim Henson Company characters that they still use today. So how did you first get involved with performing characters for the Jim Henson Company and the Muppets? Again, Ed Christie – wonderful, wonderful man. I had done a couple of performer workshops by then, but hadn’t been hired for any jobs yet. 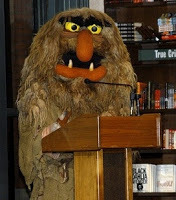 One day, they were looking for someone to do a live Sweetums appearance. John Henson wasn’t available so they called Ed who had performed Sweetums on a number of occasions. I had experience doing walkaround characters so Ed, with extreme generosity, recommended me. He did that even though it would take me away from the office and away from helping him with his work. Few bosses are that cool. Anyway, John Henson trained me for the gig and that was my first job as a Muppet performer. One of your early Henson performance gigs was on "Bear in the Big Blue House". What characters did you perform? I was basically a utility puppeteer on that show. I mostly did the doubling for Treelo and Pop, but every once in a while I got to voice a character too. I did Whiner Tutter in the Tutter Family Reunion episode. Who could possibly forget that breakout character? What was the atmosphere of the set of "Bear" like? Super fun and super fast! I worked mainly on the third season of "Bear" so by the time I got there it was a well-oiled machine. Thankfully, I had lots of help from all of the cast members and especially Jim Krupa. Jim taught me the basics of character framing and how to work with a multi-camera setup. Noel MacNeal also taught me a lot, but that was more stuff like how to sleep inside your bear suit without anyone knowing, and the difference between Johnny Walker and Jack Daniels. Outside of Henson, you've done work on other puppet shows. One notable project you worked on was "Greg the Bunny". How did your involvement in that show come about? "Greg the Bunny" was a terrific show to work on and one that was definitely retired before its time. I had just moved to Los Angeles when they were casting for it and it was the first thing I auditioned for out here. That’s pretty much it. They sent out scripts, I came in and read for it, and they decided to hire me. If only it worked that way every time. What was your favorite character you did for "Greg the Bunny"? And how were you involved in developing or shaping the character? The main character I performed on the show was Tardy Turtle. He only had one line in the Sock Like Me episode, but they ended up making him a recurring character. For me, the important thing with Tardy was keeping him sweet and funny without making him the object of ridicule. It was never clearly stated whether or not Tardy was mentally challenged, and I definitely didn’t want to offend anyone. I think what made it work was that the other characters on the show treated him with respect and no one was ever mean to him. That and the fact that he was a turtle. I mean they’re supposed to be slow, right? In 2002 Comedy Central started producing "Crank Yankers". What was that project like? "Crank Yankers" is BY FAR the hardest project I’ve ever worked on. We would typically shoot ten to twelve hour days, then I’d go home and spend another two to three hours memorizing the next day’s calls. Getting a puppet to convincingly lip-sync to a pre-recorded vocal track can be very challenging, especially when it’s an adult talking. All of the pauses, stammers, throat clearing, etc. that happen in normal human speech are difficult to memorize then re-perform while doing all sorts of blocking and prop work. On the first season we did okay with it, but you can fake your way through a lot (which we did). For the second season, Paul McGinnis joined the cast full time and really raised the bar. He was truly dedicated to getting each little nuance in the vocal track and would come in unbelievably well prepared. Of course, we couldn’t let Paul show us up so the rest of us started doing the same thing. I think I’ve lost countless brain cells and possibly years off of my life memorizing those calls. Thanks, Paul! How is performing for more adult audiences with such programs as "Greg the Bunny" and "Crank Yankers" different from working with the more family-friendly Muppet characters? I got into puppetry in the hopes of doing the kind of meaningful, educational material I had seen on "Sesame Street". While I lived in New York, that’s primarily what I did. "Greg the Bunny" was a departure from that, but a welcome one. It’s a fun change of pace to work on material that is geared towards adults and there’s definitely value in simply making people laugh even if they aren’t learning their ABC’s. What were some of your favorite aspects of, or specific moments from, the 34-episode run of "From the Balcony"? Honestly, the best part about it was working with Drew Massey. He and I have partnered up on lots of projects in the last several years and I think we’ve developed a good chemistry as performers. For "From the Balcony", we did about ninety-five percent of the puppeteering so we worked on just about every scene together. We were also involved in the creative meetings and got to pitch characters and segment ideas. He’s a terrific guy to work with. 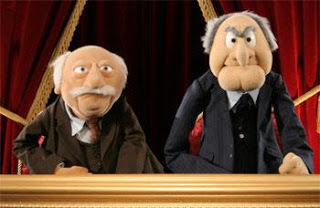 There were a lot of new Muppets introduced in "From the Balcony". What original characters stand out as some of your favorite? I loved doing The Blimp. It was so cool to perform that huge-headed character from the "Muppet Meeting Films" and to try and find a voice to match his look. I also loved doing the rats Stan & Louie and Oliver & Larry from Film Crew Theatre. Are there any interesting secrets, odd bits of trivia, or cool Muppet information from behind the scenes that you could share with the fans? Drew Massey has seven fingers on his left hand and can not digest cheese. Also, Muppet penguins have recently formed their own aquatic bird union and are possibly going to strike in the coming months. I’m not sure what their issues are. Aside from puppeteering, you've also done a bunch of voice-over work. What are some differences between doing voices and puppeteering? Voice-over work can be really freeing because you aren’t responsible for the physical manipulation of the characters. It allows you to concentrate solely on your vocal performance and you can really just let loose and have fun. What’s hard is that you have to build the entire performance with your voice. A puppet can say so much with a slight tilt of the head or a subtle gesture. With voice-over, you have no idea how your performance will be animated so you can’t rely on any of that work to be done for you. Since 2005, you've been a part of The Jim Henson Company's "Puppet Up!" improv troupe. Is this the first time you had done improv? I actually studied and performed improv as an actor in New York City. I also took classes with the Groundlings when I first moved to Los Angeles. The big difference with "Puppet Up!" is that we are doing the improv while using puppets and playing to a camera. What is the hardest thing about doing a show like "Puppet Up!"? The hardest part is just being able to stay relaxed and do really good improv. The majority of the group has been doing professional puppet work for several years so the puppet and camera part is second nature to us. Trying to create a memorable scene with strong characters and relationships in a three minute bit based on an audience suggestion, that’s the tough part. Do you have a favorite "Puppet Up!" character or bit that you have been a part of? In our recent performances in Australia, I did an improvised rap each night based on a made up title of a fairytale we got from the audience. That was tough to do (and scary), but really exciting too. I also do a character called Duckboy that I like, but my wife doesn’t think he’s particularly funny. She’s usually right. As a puppeteer, have you had to adapt or adjust to performing the characters on stage in full view of the audience? Not really. Unlike "Avenue Q", our performance as humans isn’t really meant to be played to the audience. It’s more like they are getting a sneak peak behind the scenes while the show is happening. I do the same exact thing I would do if we were shooting a film or TV show where I wasn’t seen. I just spend more time combing my hair before we go on stage. Who are some of your comic inspirations or heroes? Certainly in the world of puppetry Frank Oz has influenced all of us. I think he figured out early on that one of the secrets to comedy is creating characters with depth. He did that wonderfully for the Muppets. Richard Hunt was brilliant. I think Forgetful Jones is one of my all time favorite characters. Beyond puppets I draw inspiration from lots of things. I love the Christopher Guest/Eugene Levy films. Will Ferrell, Ben Stiller, Vince Vaughn – all of those guys are great. You are involved in the upcoming Henson project "The Skrumps". What kind of advantages do you have to when performing a digital character, such as Wishbone, that you may not have with traditional puppet? One advantage is that we can do separate layers of performance. For example, if we had a great take of a scene, but the eye blinks were a little off we can go back and re-perform just the blinks while keeping everything else. We don’t do a whole lot of that because the performances are generally stronger if you keep the whole thing, but sometimes it can be very useful. Another advantage is that we have the benefit of working with extremely talented motion capture performers. They perform the body of the characters and they will often have great movements or ideas for a scene that I wouldn’t have come up with on my own. It really makes the performances a team effort. We also don’t have to raise our arms above our heads when we perform which helps me to preserve my already deteriorating spinal cord. So what are some disadvantages of using digital characters that you don't have with traditional puppets? My favorite use of puppets is having them out in the real world. I like seeing the three dimensional puppet being performed in real space with real humans and locations. I’m sure we could put the characters out in the real world, but I think digital puppets look the best when they remain in a digital world. It’s not so much a disadvantage, just more of a personal preference. There seems to be a lot of exciting things in the works at Henson. Are there any upcoming projects that you're involved in that we should be watching out for? I believe they just screened a new project called "Sam Plenty" at Comic-Con in San Diego. It’s a throwback to the old Gene Autry Show and was created by super-genius Paul Rugg. Definitely keep an eye out for that. We are also going to be doing monthly performances of "Puppet Up!" at the Avalon Hollywood starting in August. What type of message would you want to send to aspiring performers who want to break into the business? Determination is everything! There are lots of performers out there with varying degrees of success and talent, both of which are completely subjective anyway. For me, working really hard at what you want to do seems to be the only way to achieve your goals. I know it sounds cliché, but it’s actually true. People drop out of this business every day and the ones who are left standing at the end of the day are the ones who have careers in entertainment. Also, study acting! One of the biggest mistakes I see aspiring puppeteers make is that they watch a lot of puppet shows (which is great), but don’t ever take an acting class. Being a good actor is essential to being a good puppeteer. Without the acting, the rest is just smoke and mirrors. Is there anything else you'd like to say to the fans out there? Thank you, thank you, thank you. I am so grateful to be able to earn my living the way that I do. The support of puppetry fans is what makes that possible. 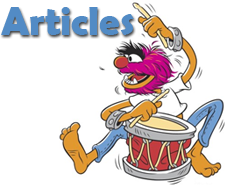 In particular, Muppet fans rock! Jim Henson made so much magic in his lifetime. We’re all so lucky to be a part of that. Also, watch out for Noel MacNeal. That guy is trouble! We would like to extend a giant "thank you" to Victor for taking the time to answer our questions and share a bit of insight on his career and work. It is always a treat to hear from the people behind the puppets. And don't forget to check out VictorYerrid.com for all your Victor Yerrid needs. This blog was established by Greg James on February 1, 2005. The Jim Henson Company, Sesame Workshop, or any other related company or organization.